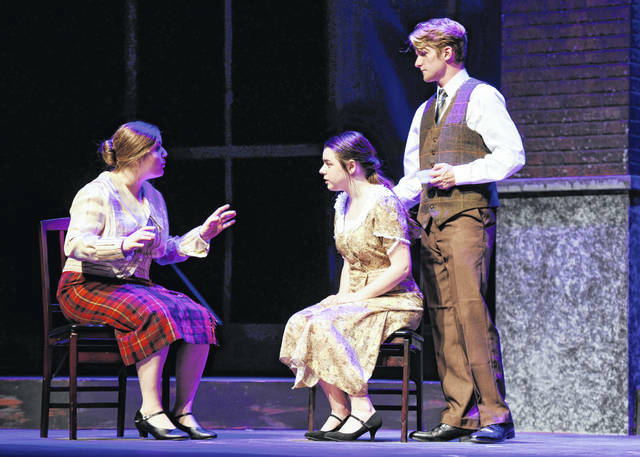 Wilmington College Theatre will present “Radium Girls” Thursday, Friday and Saturday at 7:30 p.m. in Heiland Theatre. The show looks at the American obsession with health, wealth and the commercialization of science. Pictured from left, the chairwoman of the Consumers League, Katherine Wiley, played by Ariana Riccardi, takes on the case of radium poisoning for Grace Fryer (Riley Gatlin) as Grace’s fiancé, Tom Krieder (Gage Clemens) looks on.